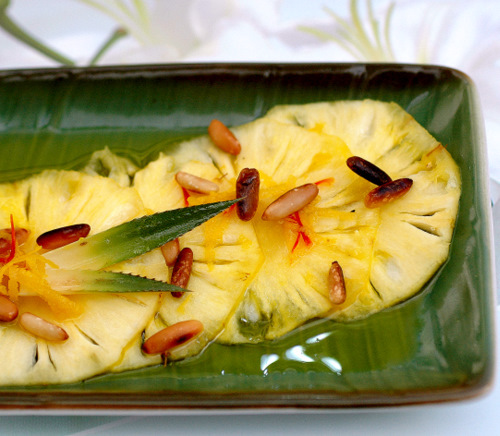 Pineapple carpaccio with saffron syrup and pine nuts. I had a crazy craving for pineapple yesterday, so I went on a hunt and found the sweet Victoria from South Africa, the big green andwatery pineapple produced in Costa Rica, coming from Miami, Florida????…. 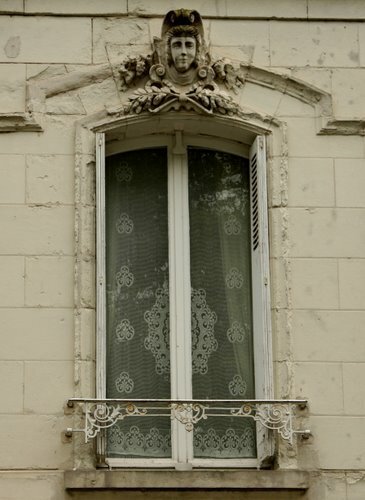 and lastly the heavy, bland one from the Ivory coast. First painting them(and in the meantime eating some), I afterwards made a carpaccio from the small , sweet Victoria, which has a beautiful dark yellow colour and an intense flavour. Take a pineapple of your choice(I prefer the small dark yellow Victoria), peel and cut into thin slices. In the meantime, bring a 1/2 cup of water to the boil, add 1/4 cup of sugar, a pinch of saffron threads, juice of half a lemon and zest of a lemon. (Be careful fro too much saffron, it is very powerful. Two to three strings on 1/2 cup water is plenty) Reduce until syrupy, about 15 minutes. If you want a thicker syrup, simmer for longer. Dry roast a handful of pine nuts in a pan, leave to cool. Spoon some juice over the pineapple slices, decorate with some pineapple leaves and sprinkle with the roasted pine nuts. This is a quick starter, popular with everybody. It can be played up or down, with more vegetables added, or less or different ingredients. Instead of the pine nuts, pumpkin seeds can be added, in which case a roasted pumpkin seed oil would be perfect. Be sure to serve it with the courgettes still warm. A great dish for spring and summer, served on a hot spring day or a summer evening, while watching the sun fall away slowly below the horizon. Preheat the oven to 200 degr. C.
Wash and slice the courgettes on the diagonal. Plce in and oven dish, sprinkle with olive oil and rosemary salt. Roast in the the oven until nicely caramelized. Place a mixture of washed and dried salad leaves on 4 plates. 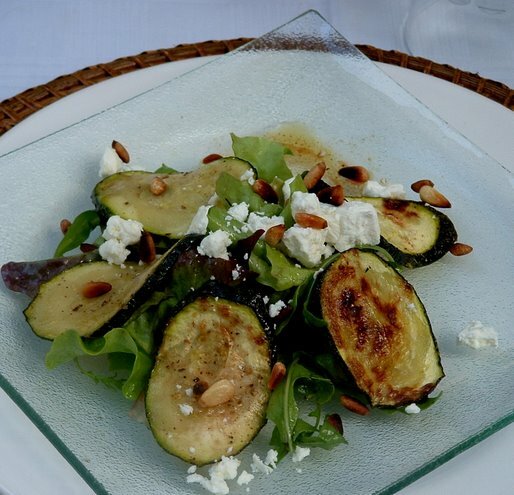 Serve the still warm courgettes on the salad leaves and top with crumbled feta cheese and dry roasted pine nuts (or almond flakes). Drizzle with olive oil, lemon juice, honey and finish off with a sprinkling of pepper. 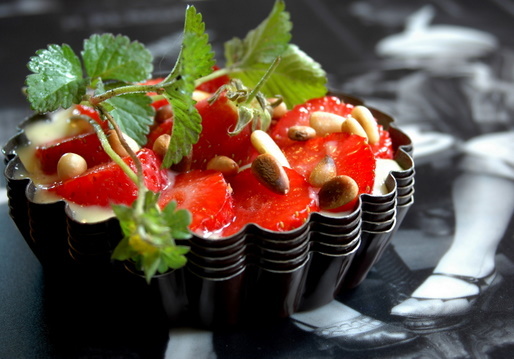 Strawberry tartlets for an award. I received The Yummy blog Award from the elegant and talented Jennifer at Vegeyum a few days ago. So I thought I would bake Jennifer a cake, a typical South African way of showing appreciation. I grew up with my mother constantly baking a cake of some kind for a someone of some kind to say a thank you of some kind. It made everybody happy. My mother was happy, because she loved doing it, the receiver was happy of course and the people in close vicinity were happy, since everybody got to share in the gift. So I baked her a cake, a strawberry tart. I like simple. And that goes for desserts too. 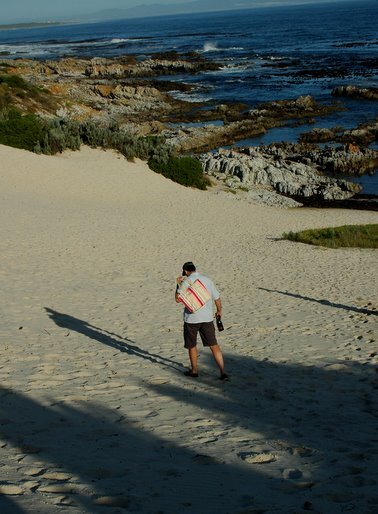 Well, actually, according to various opinions, I can rather complicate life, but let’s say then I try to keep it simple. 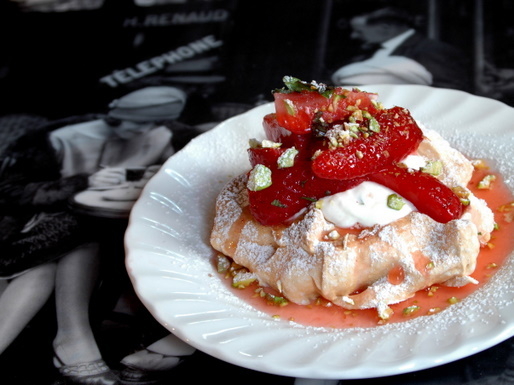 I tried to make a simple strawberry tartlet, with just a tiny twist… The first attempt was a failure in terms of presentation, but it tasted not too bad. Or so my audience said..
Cookie crumb base: Mix about 12 speculoos, crumbled, with 40 g of melted butter. With the aide of cooking rings, shape into round bases and set aside in the fridge. Heat the milk and lime zest and leave aside to infuse. Stir the maizena into the lime juice and add to the egg yolks. Slowly add the warm milk through a sieve, while whisking. Return to the heat and cook over low heat until thick, while constantly stirring. Remove from the heat, add the butter, cover with cling film and leave aside to cool down and store in the refrigerator until needed. Heat the oven to 120 degr. C. Line a baking sheet with Bakewell paper. Beat on high speed until firm. Add 2 high spoon fulls of sugar to the mixture and beat again until stiff and glossy. Fold in the rest of the sugar. Shape big spoon fulls of meringue onte the baking sheet, depending on how big you want your little tartlets, shaping a hole in the centre. Bake for about 20 minute, cover with a sheet of peper and bake another 40 minute. Switch off the oven and leave the meringues in the oven, to dry out completely. Strawberries: Wash and cut a handful of strawberries into quarters. Sprinkle with a tablespoon of sugar, a drizzle of white balsamic vinegar, some grated lemon zest. Fresh whipped cream with a packet of stabilizer added to keep the cream firm. Joghurt can be added to make lighter. Serving suggestion: Place a meringue on each individual plate. Fill with a scoop of whipped creme, arrange some strawberries on top and drizzle some of the juice of the strawberries over the top. Finish off with a sprinkling of chopped pistachio nuts and mint and a drizzle of thick balsamic syrup(optional). The third attempt was probably more what I was looking for and it actually delighted my taste buds, like all strawberry tartlets do! Voila!! My most favourite dessert…for now. Scrape the seeds from the vanilla pod and mix with the sugar. Sift the flour onto the work surface and work the butter through with your fingertips until the mixture resembles breadcrumbs. Make a hole in the centre of the flour mixture and break the egg open into the centre. Add the sugar. Mix the ingredients lightly together with the fingertips, until a dough forms. Knead lightly with the palm of the hand to shape into a ball. cover with clingfilm and leave to rest for an hour in the fridge. Cream filling: Mix together 200 g of mascarpone cheese and 2 tablespoons of Bulgarian joghurt. Add some lemon mint chiffonade. Leave to infuse. Strawberries: Wash, cut and sprinkle lightly with rose water. Roll out the dough and cut into desired shapes for your tartlet pans. Cover the bases with bakewell paper and add beans(blind baking), leave in the fridge for a few minutes. Prick lightly with fork and bake blind at 200 degr. C for about 12 minutes. Remove the paper and beans and bake for another 3 minutes until golden. Remove from the oven and let cool. Once cooled, remove the shells from the tartlet pans. Fill with prepared cream, add washed and cut strawberries. 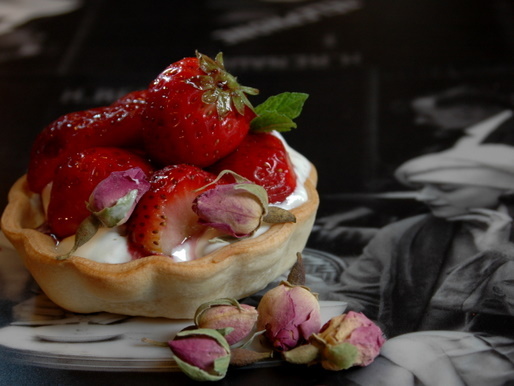 Warm some jam of your choice, add a few drops of rose water and glaze the tartlets. Decorate with fresh or crystallized untreated rose petals. Thank you for honouring me with this award Jennifer. Jeanne at Cooksister, who always has me pinned to her writing and images and recipes and bucketsful of zest for life! Lucy at Kitchen notebook, whose stories and food experiences are so vividly shared with us, it is a magical carpet ride every time I visit there! Ann and Jack at Redacted recipes, who can make a kitchen spin with action between the two of them, always fun, always exciting! Hilda at Dhanggitskitchen, who has me running to my camera, completely fired up with inspiration, every time I leave there…she has some photography secret I would love to discover! See also my link list for more inspirational work. And lastly, if you have the time, please see my friend’s daugther Claire’s thesis project on designing a cooking station. This is her final year in design and she would like some public input before her final presentation, so feel free to comment.